The stage refers to the size of the tumour in your prostate and how far it has grown- that is whether it is completely inside the prostate gland or if it has spread outside the prostate. The treatment the doctors choose will be different depending on the stage of the cancer. 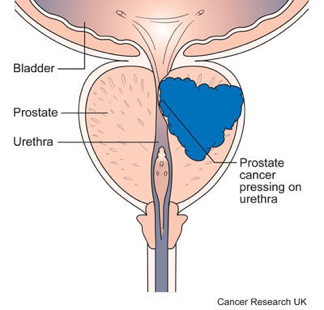 The diagram below shows a cancer contained within the prostate. There is detailed information about staging prostate cancer in this section. If you have had a biopsy,the biopsied tissue is sent to a laboratory where a doctor called a pathologist will look at the cells in the tissue under a microscope. When healthy cells become cancerous, their appearance begins to change. The more changed the cells look, the more dangerous the cancer is likely to be. The results from a prostate biopsy are usually given in the form of the Gleason score. On the simplest level, this scoring system assigns a number to describe how abnormal the cells appear under a microscope. Grade 1 and 2 are thought of as normal prostate cells. Grades 3 – 5 are thought of as cancer cells, with grade 5 being the most abnormal. The doctor will take more than one sample when you have a biopsy. This is because there may be more than one grade of cancer in the tumour. The pathologist works out an overall Gleason score by adding together the two most common Gleason grades. For example, if the most common grade of the samples is grade 3 and the second most common is grade 4 then the overall Gleason score is 7. Some doctors write the two scores separately, for example 3 + 4, instead of 7. The grade can only ever give a doctor an idea of how a cancer might behave. It cannot definitely predict what will happen. Most cancers will behave as expected, but not all. Your doctor takes your age into account because some prostate cancers grow very slowly. If you are older and your prostate cancer is not causing you any symptoms, you may live just as long without having any active treatment. So you might be offered regular checkups instead of treatment. You may find it hard to wait and see if you are offered regular checkups. But it could be the right choice for you if the side effects from the treatment might be worse than the effects of the cancer. This is particularly so if you have other health problems. If your cancer starts to cause symptoms you and your doctor can then consider which treatment is best for you. More and more prostate cancers are being diagnosed early from a PSA blood test. The PSA is a very reliable test for checking whether your cancer is growing quickly or slowly. So it can be very useful in monitoring your cancer. There is detailed information about PSA testing in the screening for prostate cancer section. The main treatments for prostate cancer are active surveillance, surgery, radiotherapy and hormone therapy. Doctors also sometimes use chemotherapy. Your doctor will have to take into account a number of different factors when deciding on your treatment. The most important of these are how fast the cancer is likely to grow and how far it has already grown. The treatment for prostate cancer has to be looked at for each man individually. Your doctor will look at what stage your cancer is at, your age and general health and what your symptoms are as well as what treatments may help. The medical team will look at the possible side effects and benefits of each treatment. Be sure to talk to your doctor about your wishes and concerns. Because prostate cancer treatment is so inidividualsied, you may come across other men with prostate cancer who are having different treatment than you. These men may have a different stage or grade of prostate cancer to you, may be a different age or may have other, different health concerns. It is also possible that their doctor has a different view on treatment. If you have any questions about your own treatment, don’t be afraid to ask your doctor or nurse. Prostate cancer that is contained within the prostate gland is called localised prostate cancer. Doctors look at different factors to divide men into different groups according to whether the cancer is likely to grow quickly or slowly, or whether it is likely to spread. They use this information to work out which treatments are best for each man. You can find information about low risk, intermediate risk and high risk localised prostate cancer in this section. Low risk localised prostate cancer is very unlikely to grow or develop for many years. Your doctor is likely to suggest monitoring your cancer. This is called active surveillance and involves keeping an eye on the cancer to see whether it begins to develop. Doctors choose to do this because your prostate cancer may grow so slowly that it never causes any symptoms. Treatments for prostate cancer can cause long term side effects, so doctors try to avoid giving treatments if they can safely do so. If the cancer starts to develop while you are having active monitoring, your doctor will offer you surgery to remove the prostate gland or radiotherapy to the prostate. You may have hormone therapy as well as radiotherapy. A Cochrane review in 2011 looked at research comparing different treatments for localised prostate cancer. This review found that after 5 years of follow up, internal radiotherapy (brachytherapy) worked as well as surgery to remove the prostate gland. You can see the prostate cancer treatment review on the Cochrane Library website. There is a plain English summary at the bottom of the review. Although the treatments worked equally well in curing the cancer there were differences in side effects. Men who had surgery were more likely to have urine leakage (incontinence of urine). Men who had brachytherapy were more likely to have bladder pain and the need to pass urine often. The researchers say that we need more research to find out which treatment is best for men with localised prostate cancer. There are some trials comparing active surveillance with giving surgery or radiotherapy for localised prostate cancer. There are details about the ProtecT trial on CRUK’s clinical trials database. This trial has closed and they are waiting for the results. In men younger than 65, the risk of the cancer growing within their lifetime is higher. So doctors may offer treatment with surgery to remove the prostate gland or radiotherapy to the prostate at an earlier stage than in older men. Your doctor may suggest cryotherapy or high frequency ultrasound therapy as part of a clinical trial. These are not readily available in Ireland but are available in the UK. In men with intermediate risk prostate cancer, the cancer may start to grow or spread within a few years. Your doctor is likely to suggest surgery to remove the prostate gland or radiotherapy. This may be external radiotherapy to the prostate or internal radiotherapy (brachytherapy). If you have radiotherapy you also have hormone therapy before, during or after the treatment. Surgery and radiotherapy work equally well in curing the cancer but they have different risks, benefits and side effects. Your doctor can explain these to you. If you don’t want to have surgery or radiotherapy straight away, your doctor may offer active monitoring of the cancer (active surveillance). Your doctor may offer you cryotherapy or high frequency ultrasound therapy as part of a clinical trial. These are not readily available in Ireland but are available in the UK. High risk prostate cancer may start to grow or spread within a couple of years. Doctors usually suggest surgery to remove the prostate gland or external radiotherapy to the prostate. They don’t often use internal radiotherapy (brachytherapy) for high risk prostate cancer. The cancer cells may have spread slightly away from the prostate gland and internal radiotherapy may not reach them all. Men who have radiotherapy also have hormone therapy before, during or after the treatment. For men who are not well enough to have radiotherapy or surgery, doctors may recommend monitoring the cancer or hormone therapy on its own. If your prostate cancer has broken through the capsule surrounding your prostate gland, it is called locally advanced prostate cancer. The usual treatments are external radiotherapy to the prostate gland or surgery to remove the prostate gland. These treatments have different risks and benefits and your doctor will discuss these with you. You have radiotherapy to the prostate gland with a course of hormone therapy. You may have hormone therapy before radiotherapy and alongside it for 3 to 6 months. Men with a Gleason score higher than 8 usually take hormone therapy for at least 2 years after the end of the radiotherapy. If you are not well enough to have surgery or radiotherapy, you may have a course of hormone therapy on its own. Cryotherapy and high frequency ultrasound therapy are not standard treatments but your doctor may offer them as part of a clinical trial, these would only be available in the UK. Injections each month or every 3 months or 6 months. Another way of reducing testosterone levels is removing the testicles. This is called surgical castration or orchidectomy. It quickly lowers the testosterone levels and can control the cancer very well. Orchidectomy or hormone therapy can control the cancer for a few years in many men. When the cancer starts to develop again, your doctors may suggest treatment with chemotherapy or steroids. These can control or shrink the cancer for some time. Chemotherapy can work well at controlling advanced prostate cancer in some men. If your cancer has spread to your bones and is causing you pain, your specialist may suggest radiotherapy to the affected areas of bone. Radiotherapy for bone pain can work very well to strengthen the bone and relieve pain. The damaged bone begins to repair itself after radiotherapy treatment. Bisphosphonate treatment can also reduce bone pain and help to reduce the risk of bone fracture.